Over the past eleven years Knalpot’s Gerri Jäger, Raphael Vanoli and Sandor Caron have become a strong working trio. 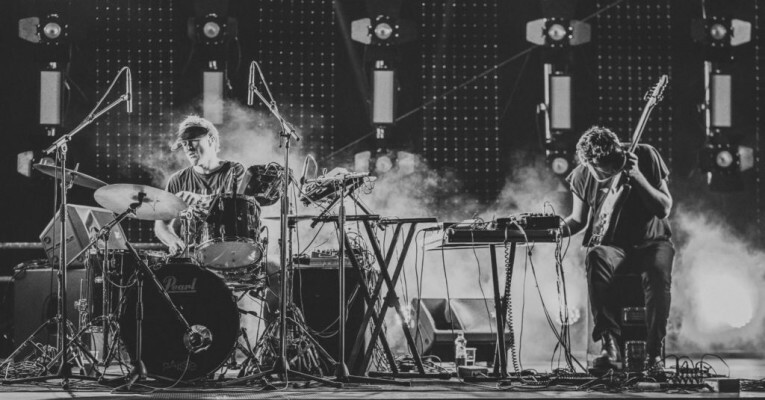 They belong to the most uncompromising electronic rock acts of this day and have performed extensively all over Europe, Russia and Brazil including many major festivals. They have collaborated with Manu Delago and Graduale Nobili (Björk), Rabih Beaini (Morphosis), Eirikur Olafsson (Sigur Rós, mùm), Jozef Dumoulin (Keiji Heino), Fred Frith (John Zorn, Mike Patton), Aardvarck (Rednose District) and Ensemble Klang. Knalpot took a two year sabbatical to develop a completely new set. The album “Dierendag” (release on october 3rd through SHHPUMA/Clean Feed) marks a new beginning and shows that the band surpassed itself with an even more massive and unique sounddesign and singular approach: Drone-zone walls fluently morph into a pop song, big-time distorted drums mingle with sweet Bach-like guitar, otherworldly blown guitars are layered with processed drums and synths. The new tracks are more danceable while Knalpot trademarks like vivid energy, stumblegrooves and their omnipresent sense of joy, freshness and freedom remain.